Shareholders and investors play a vital part in the success of any business. Especially if the scope of operations is big or the market niches being targeted by the market is broad, business owners need to have stakeholders and investors to financially back up the needs and demands of the company. With an established and well-financed corporate foundation, it will be easier for businesses to supply the items that the market expect from them. With the importance of shareholders and investors, it is essential for businesses to ensure that they will deal with these entities with utmost respect and readiness. A way to showcase these is by always being prepared with presentations and other instances where there is a need to communicate with them. This is where the necessity to have a to-do checklist and/or other kinds of corporate checklist enters. 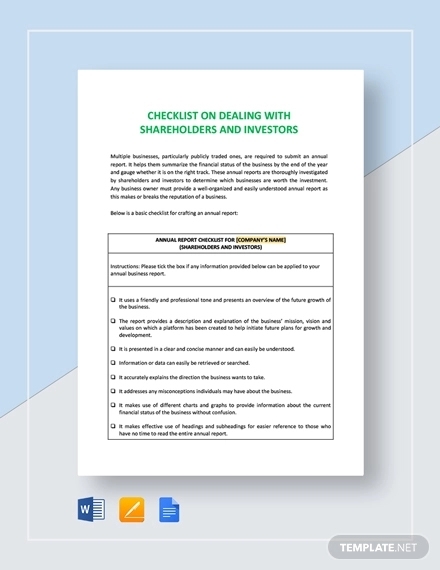 If you want to properly deal with the shareholders and investors of your business, be guided by a checklist that can allow you to remember the things that you need to prepare, develop, present and maintain. What Should Your Checklist Contain? A heading that contains the name of the business and other relevant corporate information. These details can actually be altered and edited depending on the desire of the time management. The main point of doing this is by ensuring that the checklist will not be misplaced and that it is tagged accordingly. This will help the person who is keeping the checklist to not mistaken the document with other checklists that he or she has in hand. The documents and other materials that are necessary to be prepared. The most important things that should be seen in the checklist that you will create are the tools that you will present. As stated above, being prepared with your presentations only means that you value the time of your stakeholders and investors. This can give a positive impact with regards to harnessing your corporate and professional relationship with them. The call to actions that are needed to be done on certain time periods. Aside from the documents, tools, and materials that you need to prepare; you should also be keen on enlisting all the tasks that should be accomplished. It will be best if you will have a timeline of activities so that your checklist samples can be more organized. The dates and schedules of stakeholder and/or investor meetings. If there are already scheduled meetings, your checklist should have the specific dates and time of those meetings. You can do a general checklist that may include all these information or you may have minor checklists that will entail specific activities and things to look into. You may also see the seminar checklist. Other information that is essential to be prioritized. Aside from the items specified above, it will depend on the particular needs of your business or the kind of presentation that you plan to have where you can include other calls to actions. Ensure that the content formulation and structure of your checklist is based on the specific needs of your stakeholders and investors meetings. One of the main documents that will be presented to the shareholders and investors is the annual report. When dealing with these people, you have to make sure that your annual report is at par or even better with what they expect. You can only achieve this if you will have a checklist for the annual report that you will showcase to them. These items included in the checklist, when carefully put together through an actual annual report, can make the business more marketable. This can fully affect the decision of the stakeholders and the investors on whether they will allot their money, time and effort to the business or not. Listed below are some of the tips that you can incorporate in the development and actual creation of your checklist which is purposefully done to come up with a good relational foundation with your business’ stakeholders and investors. Your checklist should not only contain a review of the things that your company has accomplished. Just like your reports, it should not be just a review or a recap of your achievements. It should also contain items that you are looking forward to. This way, investors, and stakeholders can be enticed with the developments that you plan to build and realize with them. Being future-oriented can make the entire transaction more exciting and thrilling at a business level. Your checklist should also have the details that you need to present when it comes to finances and accounting. The financial data of your company should be readily available. As many of us know, it is the current financial situation, operational condition and field reputation that gets the most crucial review from investors and stakeholders. You can also write a progress report if you truly want to impress the people that you would like to invest and take part in your business. Coming up with a checklist that can help you organize these details can help you benefit even more from the possible transaction to take place. Your checklist must have an overview of your market and business operations. You need to be on the same page with your stakeholders and investors especially when it comes to how they look at the opportunities and possibilities for your business. List all the things that you need to discuss your current market hold, prospective market niches, and operations. This way, stakeholders, and investors can be aware that you are on the business path where they would also like to go. Is My Checklist for Dealing with Stakeholders and Investors Good Enough? If you have already created the checklist that you will use for dealing with stakeholders and investors, you must first review the entire document before proceeding to implement all the call to actions that it entails you to do. Here are some of the metrics that you can look into when browsing through the checklist that you have created: You may also see safety and security checklist. Prepared to Create a Checklist of Your Own? You should treat your checklist for dealing with stakeholders and investors as a marketing tool. Even if you will just use it to organize the things that you need to present during a meeting, it should still provide the best items that can lead to the positive impression and perception that you can give to the investors and stakeholders of the company. There are different kinds of checklists that you can come up with. This will vary on the particular presentation that you need to prepare for or the specific activity that you will do for your stakeholders and investors. It will be a big help if you can download samples of existing samples used in the same manner. If you will be able to do so, this will allow you to collect references when developing the checklist that you will use. Using templates as your guide is also a great idea. As long as you can edit it based on your needs, we highly recommend the usage of these guides so you can have a more efficient and faster time while creating the marketing checklist that you plan to create.